There were two. A very large outdoor pool with fountains, terraces and gardens; and a smaller indoor pool. 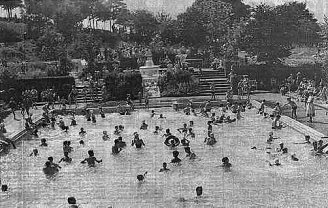 The outdoor pool opened in 1935 on an area of Dunstable Downs, known from ancient times as "California". The photo above was taken by the Dunstable Gazette in 1959. It was widely believed that this was the nicest pool in the country but local people wanted heated water, so Eddie Green built an indoor pool on the front of the ballroom to cater for this need. It opened on November 1st 1960 - half an hour late because a thunderstorm had affected the electricity supply. Six feet three inches at the deep end, it had a fountain and a children's paddling pool. The indoor pool was out of use by 1967. We believe it was converted into the lower entrance to the Ballroom and the Devil's Den sometime around 1968. If you know different please tell us. Customers for the outdoor pool got less and less but it struggled on, finally closing in 1973. It was turned into the Skate Park in 1978. The photo below shows the work taking place. Dunstable Town Council has been forestalled in its proposed scheme for a swimming pool. Land has been purchased at the foot of Dunstable Downs, and, provided that other details in connection with the enterprise arrive at a satisfactory issue, the pool, which will be of the most modern type, will be ready for use before the end of May. The question of the provision of swimming facilities for Dunstable has been one which has exercised the Town Council for over two years, but it was not until the beginning of last year that the suggestion of an open-air pool was put forward and favourably considered. Since then the Council have been looking for a suitable site. The new venture is being sponsored by Mr J E Nelson of Winchester House, Shernhall Street, Walthamstow, who has purchased a piece of downland about two and a half acres in extent, from Mr A H Rollings of Tring Road Dunstable. The site is in a hollow of the Downs and appears to be ideal for the purpose for which it is intended, protected as it is from the elements by the promontory at the foot of which it nestles. It is contiguous to Mr Rollings' quarry and by reason of the fact that it is approximately on the same level as the quarry, is easy of access. The site has a frontage to the Whipsnade Road and is within a hundred yards of the junction of Tring Road. Mr Nelson has already engaged an architect to draw up plans for the swimming pool and an addition, there will be a smaller pool for children, with a graduating depth of from two feet six inches to three feet six inches. It is the desire of the promoter of the scheme to make the main pool one of the most attractive and up to date in the country. In an interview Mr Nelson told a "Gazette" reporter that from the hygienic standpoint, the pool would meet the requirements of the most fastidious, for he stated that it was his intention to install filtration plant that would purify and aerate the volume of water in the pool every four hours, as compared with eight hours this process normally occupies. It is probable that there will be a car park for two hundred vehicles, and it is also intended to create a pavilion, which will be open to the public generally, for the sale of refreshments. It is probable that the work will commence within the next fortnight. Work is expected to commence within the next fortnight on the erection of the open-air swimming pool at the foot of Dunstable Downs. The pool, which is anticipated will be ready for use by the end of May, will be one of the latest type, with filtration plant. A children's pool is to be included and other features will be a sunbathing beach and a car park. The illustrations below (above and below - ed.) show the front elevation and ground plan of the new pool. The above plans are a little hard to read, even in the original fiche so I've attempted to translate them below. behind these are areas labelled womens and mens which I assume were the toilets. These were flanked either side by a grassy slope. surrounding the pool is a paved area, flanked on the left by a sunbathing terrace with steps up to it. A similar terrace with steps down, flanked it on the right but this was backed by what appears to be a large Pergola running the length of the pool. 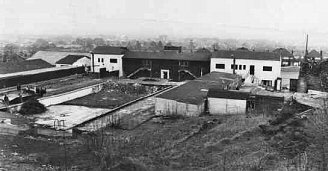 The pool itself was 125 feet long and 45 feet wide with the deep end and the diving board being closest to the main building. There seems to be a small springboard halfway down the pool on the right and at the far end, steps down onto the shallow water. The depth started at 3 feet and sloped down to 8 feet 6 inches. On this plan I can see no sign of the promised children's pool. I suspect that this was off the top of the drawings published as the photograph below appears to show shuttering set up for an octagonal structure. If anyone is interested, the other big news that week was a reader's monster potato.